Easter isn’t just for humans. These sea otters get to enjoy the perks of the pastel-colored holiday as well. 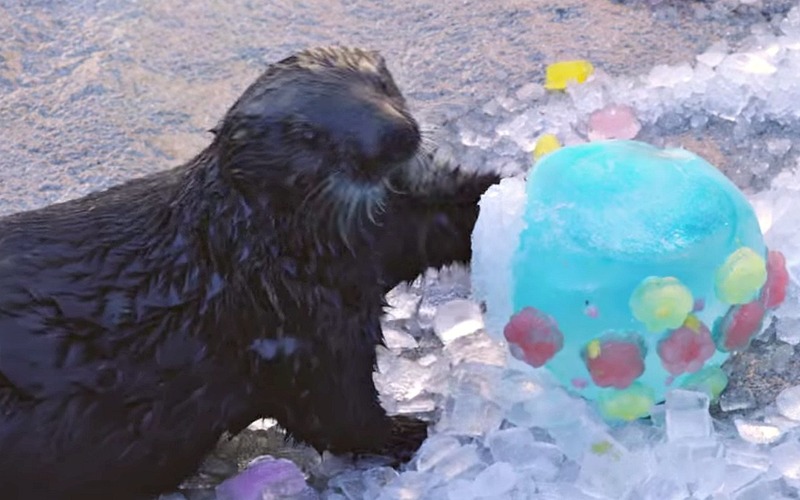 At the Monterey Bay Aquarium, rescued sea otters were given Easter-inspired treats to munch on — ice in the shape of Easter eggs and toys! Wild sea otters use their strong paws (and occasionally a rock they keep in their pouch) to break open mussel and clam shells, so cracking open ice eggs is practically second nature to these guys. Here, each one picks their favorite color egg (or toy) and slowly slides it into the water, where they can get a good grip on it. It’s pretty amazing how dexterous these guys are, especially with something as slippery as ice, but ice-fielding does run in their genes, so it makes sense. Watch them quickly dismantle their colorful presents. My favorites are the ones who carry their prize on their stomachs while they happily break and bite it. Good thing kids don’t do that — there’d be egg yolk everywhere!